Maybe I have not told you yet but I ADORE scarves! They do not only keep me warm but they can instantly add that extra oomph or pizzazz to any of my outfits without making me look like I’m trying too hard. They are one of the most convenient accessories because you can just chuck it in your bag once you are inside a heated area, and then wear it again when it is time to go out and play in the cold. This weekend I met up with some old friends from University. We were a group of foreigners, and two girls were also Filipino like me. I have to say, I love how Filipinos are just naturally thoughtful and generous especially in parties or social gatherings! One of my Filipino friends brought gifts for each of us just because we had not seen each other in a while! It was sweet! I was already ecstatic that I received a gift but I was even happier when I saw what it was. Mary Anne, my Cebuana friend, gave me this knitted crimson coloured infinity scarf! I decided to talk about infinity scarves today because I think these are one of the most useful and stylish accessories any girl could have during the colder seasons. Infinity scarves are basically scarves sewn as a loop. Unlike regular scarves that are shaped as a line, infinity scarves do not have edges. They are easier and more versatile to use because you can wear them in several ways without having to tie anything at all. These scarves were made to combat the bitter cold of winter so they are often made using woolen fabric. Other fabrics include faux fur, linen, cotton, and silk, among others. I personally prefer knitted scarves though… Just like that blue one below! You can wrap the scarf around your neck twice. You can wrap it loosely or tightly almost like a turtleneck.You can also just drape the scarf low around your neck. It is fuss-free, laid back, simple and yet still stylish. FASHION TIP: If you have a longer neck than most girls, do not let the scarf drape loosely around your neck as it will just add more length to your frame. 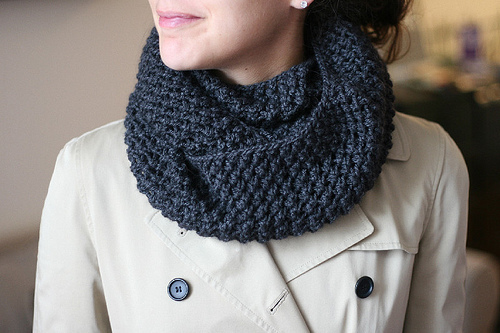 Create the illusion of narrower proportions by wearing double cowls around your neck. No one will remember calling you ‘giraffe’ again! You can also wrap the scarf around your head as a hood. It will keep your head, ears and neck warm. If the weather is terribly cold, another option is to wear it at full width around the neck and shoulders. FASHION TIP: Skip wearing infinity scarves around your shoulders if they a noticeably broad. Nothing is wrong with having broad shoulders but you would not want to add any more volume to highlight how broad they already are. Well, to be honest, there is really no rule on how to wear scarves. Everyone can be as creative as they please! My general rule, however, is that everyone should wear them with confidence and a smile. Infinity scarves are very useful and fashionable. I do hope you folks get one after reading this!